(Nanowerk News) The second issue of Nanotech Insights, a quarterly newsletter dedicated to the field of nanoscience and nanotechnology, is now available from CKMNT. We have reprinted one of the articles from this issue in our Nanowerk Spotlights last week: "Nanotechnologies to mitigate global warming". 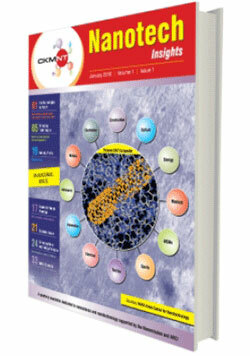 The inaugural issue of Nanotech Insights is accessible in electronic form on the CKMNT website. This newsletter, formally released in March during the recently organized ICONSAT 2010 at IIT-Bombay, is the first publication from the Centre for Knowledge Management of Nanoscience and Technology (CKMNT), which was set-up by the International Advanced Research Centre for Powder Metallurgy & New Materials (ARCI) in April 2009 with partial financial assistance from the NANO MISSION of Department of Science and Technology, Government of India. Nanotech Insights is a quarterly newsletter dedicated to varied aspects of nanoscience and nanotechnology. This publication will showcase key developments in the area of nanoscience and nanotechnology cross the globe. Each issue will cover emerging technologies, commercial and business issues, new products, green technologies, safety, healthcare and environmental issues, Indian nanoscience and nanotech scenario, Nano Mission activities, detailed nanotech patent and literature analysis, and so on. It is expected that Nanotech Insights will prove to be a valuable source of information for scientists, technologists, academicians, students, policy makers and entrepreneurs interested in exploiting the fascinating world of nanotechnology. As you will read in the first issue, the folks at CKMNT are optimistic they will be able to offer wide-ranging services to the entire nano-community in due course and, thereby, assist the NANO MISSION in fulfilling its objectives. Nanotech Insights, in particular, will strive to showcase emerging developments spanning diverse aspects of nanoscience and technology besides providing an appropriate forum to promote education, networking and dissemination of knowledge in this rapidly growing field. The just published second issue of the newsletter is again packed with information and articles on 52 pages.